Sugarcane Aphids Numbers are Building in Oklahoma. On July 12, 2016, we found sugarcane aphids in a sorghum field in Caddo county that had exceeded treatment thresholds. Jerry Goodson, Extension Assistant in Altus, reported finding a sparse colony of sugarcane aphids in Tillman county last week. Most of the sugarcane aphid infestations that we have observed so far are located south of Interstate 40. We will continue to provide weekly reports of sugarcane activity throughout the rest of the summer growing season. Oklahoma’s “Sugarcane Aphid Team” (which also includes Dr. Ali Zarrabi, Mr. Kelly Seuhs, Dr. Kristopher Giles from the Department of Entomology and Plant Pathology, USDA researchers Dr. Norm Elliott and Dr. Scott Armstrong, and Dr. Josh Loftin and Dr. Tracy Beedy from the Department of Plant and Soil Sciences), is conducting research to identify effective insecticides, resistant sorghum varieties, best cultural practices to avoid sugarcane aphid, and develop improved sampling and decision-making rules for treatment thresholds. When scouting, make sure you are finding sugarcane aphid, as it can be confused with yellow sugarcane aphid. The sugarcane aphid (Fig.1) is light yellow, with dark, paired “tailpipes” called cornicles and dark “feet” called tarsi. The yellow sugarcane aphid (Fig. 2) is bright yellow with many hairs on its body and no extended cornicles. Currently the suggested treatment threshold for sugarcane aphid is to treat when 20-30 percent of the plants are infested with one or more established colonies of sugarcane aphids. 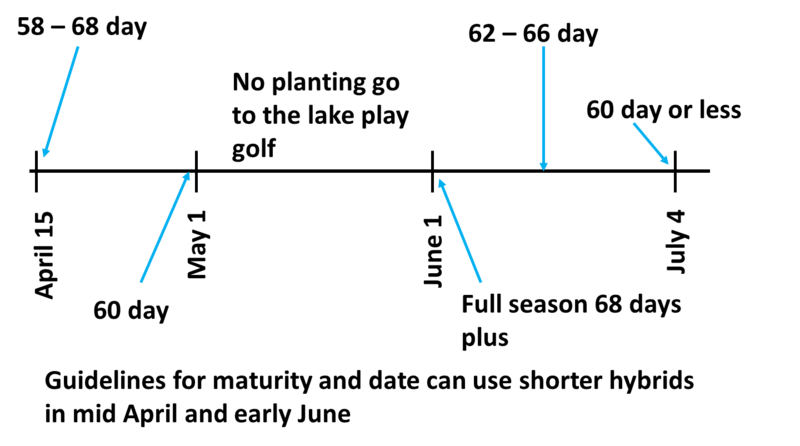 An established colony is an adult (winged or wingless) accompanied by one or more nymphs (Fig 3). Two insecticides, Sivanto 200 SL, and Transform WD, provide superior control of sugarcane aphid. Sivanto can be applied at 4-7 fluid ounces per acre. Transform WG can be applied at 0.75-1.5 oz. per acre. It is important to achieve complete coverage of the crop in order to obtain the most effective control. Consult CR-7170, Management of Insect and Mite Pests in Sorghum http://pods.dasnr.okstate.edu/docushare/dsweb/HomePage for additional information on sorghum insect pest management. This week, I received several reports of “worms” feeding in the whorls of sorghum (Fig 4) which I identified as fall armyworms. I rarely recommend that a producer treat for fall armyworms infesting whorl stage sorghum. Why? 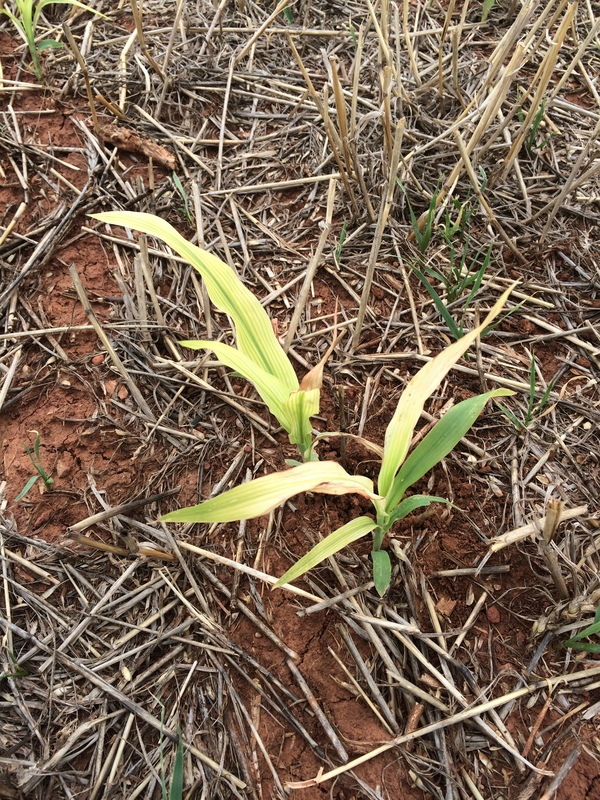 because available research suggests that under rain-fed production, whorl feeding rarely caused enough yield loss to warrant treatment costs, AND more importantly, most insecticide applications provide poor control. The poor control is a result of difficult delivery of the insecticide into the whorl allowing the caterpillars to avoid contact. However, recent unpublished research shows that some new insecticides may provide effective control of fall armyworm in the whorl, so it is time to revisit my recommendations. Recent unpublished research results conducted in irrigated sorghum out of Lubbock suggest that Prevathon®, Besiege®, and Belt® can provide acceptable control of the caterpillars in the whorl (even large caterpillars). Therefore, the second of the two reasons I listed above may no longer be true; they can be controlled. However, 1: these products were tested on irrigated sorghum 2: they are quite expensive 3: some products may flare sugarcane aphids and spidermites and 4: WE STILL DON’T KNOW HOW THEY IMPACT YIELD, thus, we are still “guessing” with regard to return on investment for control. How has this information changed my recommendations? Keep in mind that the research in Texas was conducted in irrigated sorghum with a very high yield potential. Since Oklahoma growers typically grow rain-fed sorghum which has lower yield potential, my suggestion is to examine 30 plants (5 consecutive plants in 6 different locations) and split a few stalks to see where the panicle is located. If the panicles are close to emerging (boot stage), my “best guess” is to consider treating if 70% or more of the whorls are infested and there are an average of 1-2 live caterpillars present. Under this scenario, you would be protecting physical damage to the emerging head. On choosing an insecticide I offer some things to consider. 1: the effective products may or may not be available. 2: some have the potential to flare sugarcane aphids and spidermites. 3: they are all expensive. Belt is still available for use, but EPA recently requested that Bayer voluntarily remove it from the market. Bayer refused, and asked for an administrative hearing. On June 1, an administrative law judge upheld EPA’s decision to cancel registration of Belt. Bayer is appealing and is scheduled to receive another review from the Environmental Appeals Board before July 6. If EPA prevails in the appeal process, Belt will no longer be available. However, Bayer says that Belt can still be sold, purchased and used during the appeals process. I have little information on how Belt affects sugarcane aphids or spidermites. Besiege is a mixture of the active ingredient in Prevathon with an added pyrethroid. Research in Lubbock suggests that spidermites may flare with Besiege. We also know that any pyrethroid will flare sugarcane aphid. Prevathon has not shown the propensity to flare either spidermites or sugarcane aphids. We are attempting to obtain data on the effectiveness of, and yield returns obtained from Prevathon to control fall armyworm in the whorl. Until I have more data, I can only say that a producer should carefully consider a decision to control “whorlworms”. The jury is still out as to whether controlling them is economically justified. With regard to headworms, we have well-designed decision making capability coupled with solid treatment thresholds. USDA and University scientists developed a computer-based program that can calculate an economic threshold for headworms (Fig.5) and provide a simple sampling plan that tells the producer if threshold is reached (Fig.6). Called the Headworm Sequential Sampling and Decision Support System (http://entoplp.okstate.edu/shwweb/index.htm), it uses input on the plant population, the crop’s worth and the control costs to calculate a treatment threshold. Now, prepare for the tricky part! If we only had to consider one pest, I would advise selecting the insecticide that works best on that pest. However, we now have to consider sugarcane aphid in all of our sorghum pest management decisions. In my opinion, if sugarcane aphid is already starting, a producer must consider using either Transform or Sivanto. That narrows the choice options for combining another product to control headworms because pyrethroids could flare the aphids. I have reviewed data from multiple years of insecticide trials throughout the SE US. The data suggests that products containing chlorpyrifos provide spotty control of headworms. Data that I have reviewed from other insecticide trials suggests that Prevathon and Blackhawk provide excellent control of headworms and Diamond® was also effective on headworms. For information on spray mix compatibility, talk to the local sales representatives for the products you have chosen. Consult CR-7170, Management of Insect and Mite Pests in Sorghum http://pods.dasnr.okstate.edu/docushare/dsweb/HomePage for more information. When I started writing this blog (3.13.2105) Ok grain elevator cash bids for grain sorghum aka milo was 6.61-7.70 cwt (3.7-4.31 per bushel) and corn was at 3.64-4.06 per bushel. Meaning there is currently a premium on sorghum grain. 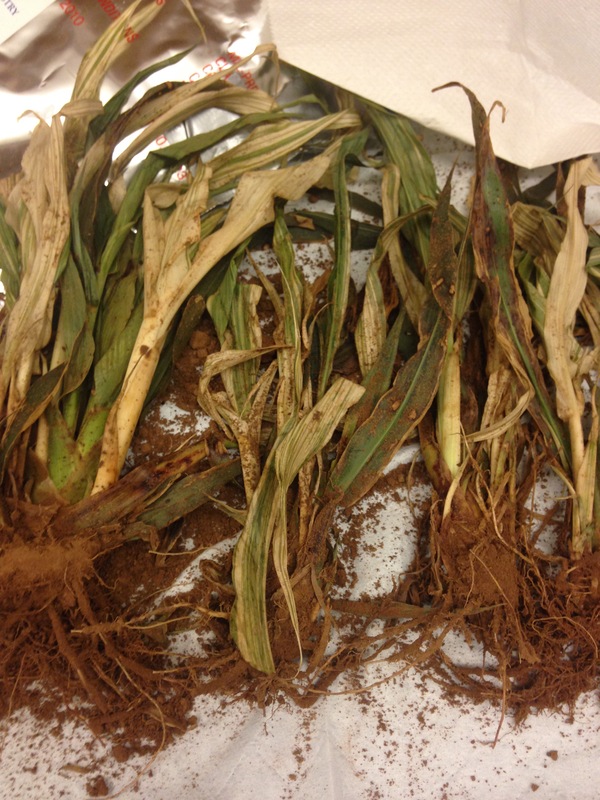 This difference among other things has increased the interest in planting sorghum. Of late I have been quite successful, at least on a small-scale, at producing sorghum yield in the 120-150 bpa range, thanks to the advice of Rick Kochenower former OSU sorghum specialist. Both of us believe that every year many producers are leaving significant bushels on the table due to one or two miss steps. I wanted to take this opportunity to share what is in my opinion the keys in producing a bumper sorghum crop. I should note that the primary key is out of our control, rain. Key 1. Planting date, the optimum planting date for grain sorghum is generally when soil temperatures reach 60° F and increase after planting. For much of the region that I believe is best suited for sorghum this falls between April 1 and April 15 for south of I40 and April 15 and May 1 north of I40. 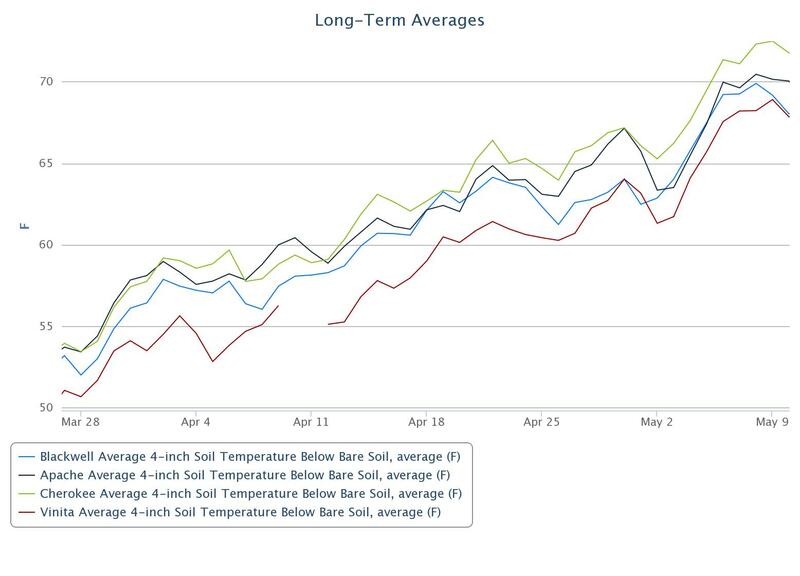 graph below shows the long-term average daily 4″ soil temp (bare soil) for Apache, Blackwell, Cherokee, and Vinita. It is easy to see how your location within the state can impact soil temps. Long term average 4 inch soil temps from Blackwell, Apache, Cherokee, and Vinita for bare soil. Data from the Mesonet.org. You should not forget however that tillage practices will also impact soil temps. 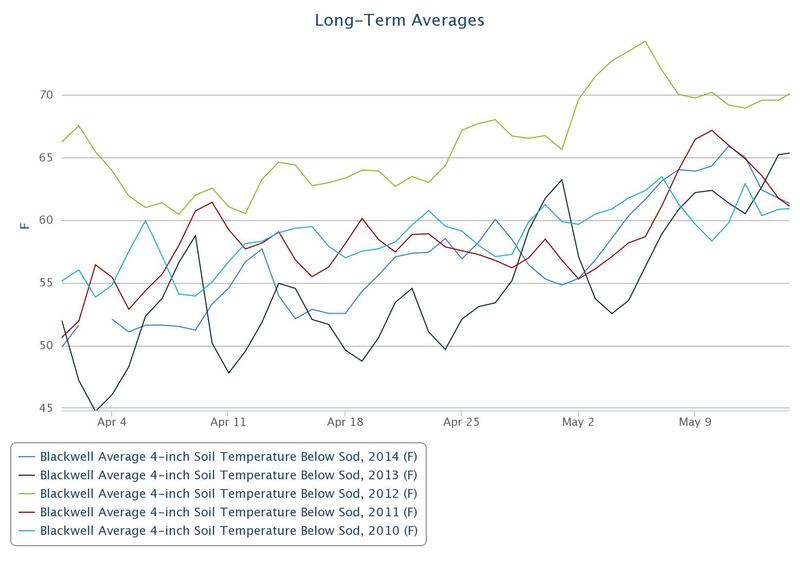 The two graphs below show the long-term average daily 4″ soil temp for Cherokee and Blackwell for both bare soil and under sod. Note that when the soil is covered by residue it warms slower. The two figures also show that residue will have more impact in some areas more so than others. Long term average 4 inch soil temps at Cherokee for bare soil and under sod. Data from the Mesonet.org. 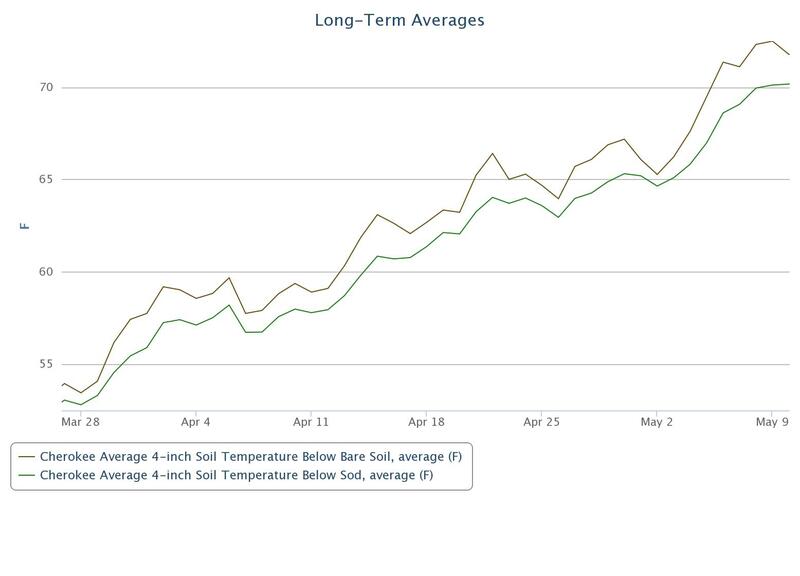 Long term average 4 inch soil temps at Blackwell for bare soil and under sod. Data from the Mesonet.org. My best word of advise is to keep a watchful eye on the Mesonet. While the long-term average is nice to know here in Oklahoma the difference in weather from one year to the next can be huge. 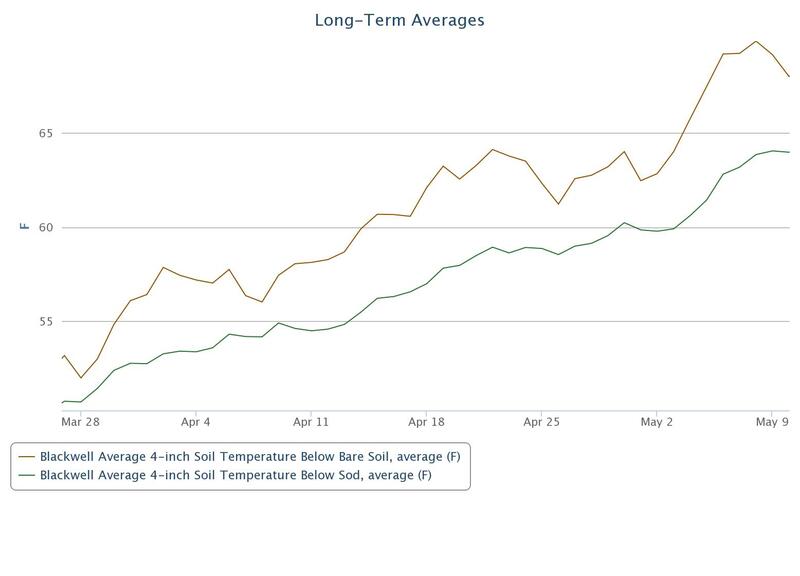 The figure below shows the average daily 4″ soil temp (below sod) from Blackwell for the past five years. Link to Mesonet Soil Temp page Click here. Average 4 inch soil temps at Blackwell for 2010, 2011, 2012, 2013, and 2014 for under sod. Data from the Mesonet.org. Another great resource is a report on planting date written by Rick Kochenower presented to RMA. Link to report. Key 2. Hybrid selection, primarily maturity group selection. 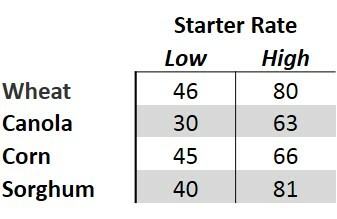 Rick has created a great graphic that helps put a planting date window with maturity group. It is always important to visit with your local seed dealer to find out what has been performing best in your region and consider the importance of stay-green, standablilty and disease packages. But for me the number one key is the selection of maturity group. This should be based upon planting date and harvest strategies. Below is a great graphic created by Rick, while this may not be scientific it is a great guide created via years of experience. I also recommend that if you are planting a significant amount of acres you should diversify your maturity groups. Not only does this spread out he harvest window but it also you to spread the risk of high temps coming early or late. An additional resource is the Sorghum Performance trial summary located on the Ok Panhandle Research and Extension Center website. Click here. Key 3. Soil Fertility, while soil pH plays a big role on sorghum productivity but it is too late in the game to do much about it this year. So the most important things to keep in mind on fertilizing sorghum are your macro-nutrients nitrogen (N), phosphorous (P) and potassium (K). It is my opinion that historically producers have underestimated the yield potential of sorghum and therefore lost yield due to under application on N. You should expect more than 60 to 80 bushel out of your crop if you put the right seed in the ground, at the right time and in the right way. Ask around look at Rick’s yield data, producers in N. Central Ok on a good soil should be going for 125+ bpa easy. Unfortunately you are unlikely to hit these yield levels if you fertilize for a 75 bpa crop. 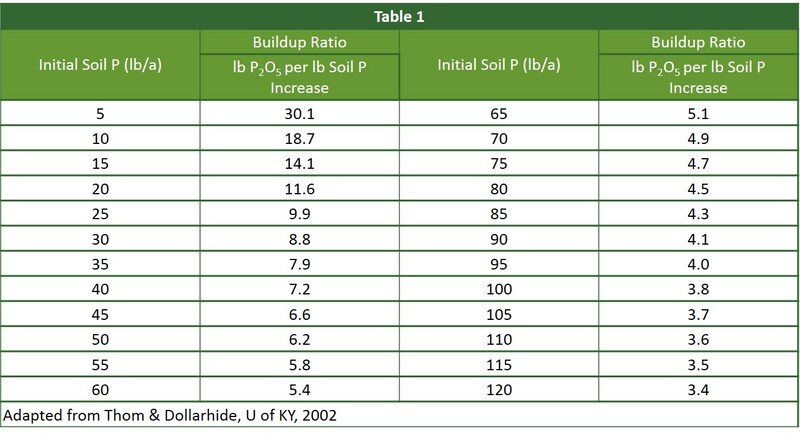 An easy rule of thumb on N fertilization is 1.2 lbs of N per bushel, for a more exact number take a look at the image below. 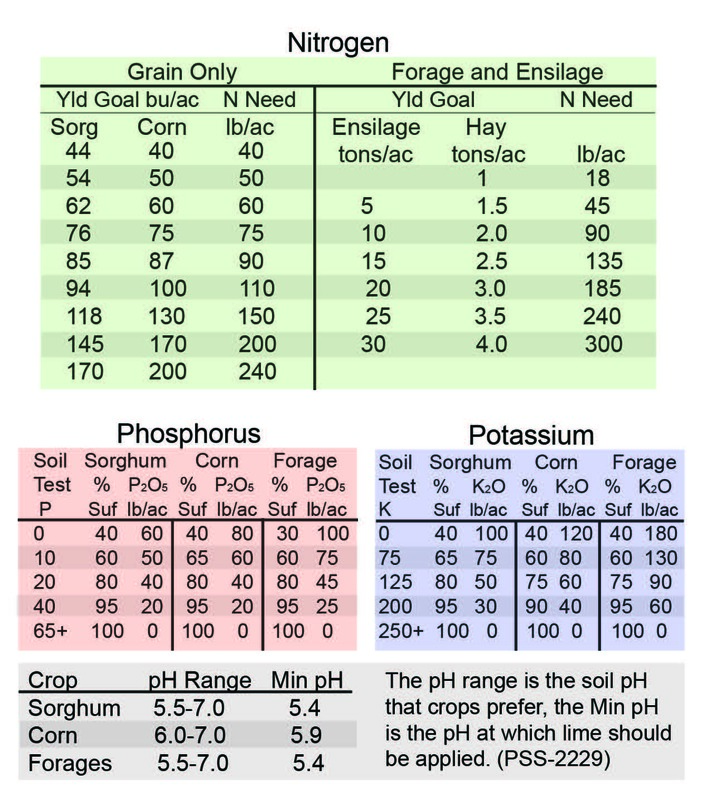 This comes from the corn and sorghum PeteSheet and is the same table that comes from the Soil Fertility Handbook. (If you would like some Pete Sheets just send me an email requesting them at b.arnall@okstate.edu, Link to PeteSheets page). Key 4. Weed Control With sorghum utilizing a pre-plant herbicide with residual is extremely important due to the lack of over the top options. 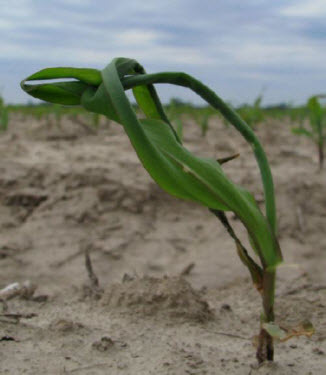 Most times proper weed control will be accomplished by utilizing concept treated seed and use of labeled rates of a pre-emergent grass control herbicide combined with atrazine. While I primarily focus of the four keys above there are a few other important items to consider. Row spacing: I like 30, but many may not have a planter so I suggest at least plugging every other hole in the drill to be at a 12″-20″ spacing. Make sure your population is correct for your row spacing. For this consult with your local seed dealer to match cultivar with row spacing and proper population. Insects: Scouting for aphids and head midge is very important, these little critters are yield robbers and can gum up the works at harvest. Harvest prep: I almost put this as the fifth key. By chemically maturing/terminating your crop you are both able to increase harvest efficiency and preserve moisture for a following winter crop of wheat or canola. While this is a good start I suggest a visit with your local OSU Extension educator, consultant or seed dealer for information about your specific situation. Just know the crop has great potential to yield big if treated right. I like to say don’t treat your sorghum crop like the stray you adopted, treat it like your hunting dog that you traveled halfway across the country to pick up. Good luck in 2015 and I hope the rains fall when and were needed.